Antonio Rodiles has been arrested more than 100 times in Cuba and beaten four times by Cuban authorities, who broke his nose and left him with other injuries, he said. Rodiles started working for the opposition movement in 2010 when he returned to Cuba after receiving a master’s degree in mathematics from Florida State University and teaching there. A leading dissident on the island, he believes Cuba will soon see an end to the Castro regime’s almost 60-year dictatorship. The Cuba Forum attracted about 130 people to the Rinker Welcome Center on Thursday night. On the panel were, from left to right, moderator Eugene Huskey, and panelists Richard Feinberg, Angel de Fana and Antonio Rodiles. 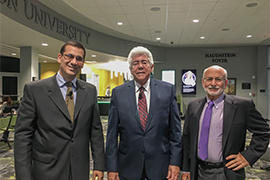 Rodiles was among three experts who debated the “Prospects for Democracy in Cuba” Thursday night, attracting a crowd of about 130 students, faculty, alumni and others to the Marshall & Vera Lea Rinker Welcome Center on Stetson’s historic DeLand campus. The other panelists were Richard Feinberg, Ph.D., a professor of International Political Economy at the University of California, San Diego, and Angel de Fana, a former political prisoner in Cuba for 20 years. Eugene Huskey, Ph.D., Stetson professor of political science, and Russian, East European and Eurasian Studies, moderated the discussion. The panelists, from left to right, were Antonio Rodiles, Angel de Fana and Richard Feinberg. Rodiles and his wife will return home to Cuba later this month. 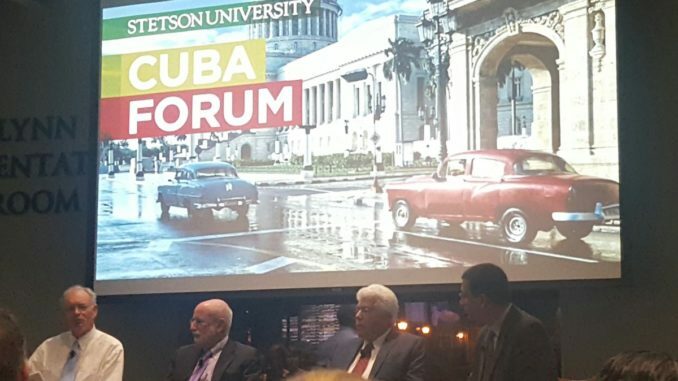 The Cuba Forum was started last year by Stetson President Wendy B. Libby, Ph.D., and Stetson alumnus Leopoldo “Leo” Fernandez Pujals, a Cuban exile who wanted to ensure students hear both sides of the debate over Cuba. This year’s forum came a day after the Trump administration announced tighter restrictions on trade and tourism with Cuba, part of Trump’s effort to roll back the normalizing of relations announced by President Obama and Raul Castro in December 2014. Opponents say Obama’s policies have enriched the dictators who have a long history of human rights abuses. The Castro family holds a monopoly on hotels, rental car fleets and other businesses in Cuba that have profited from closer relations between the two countries. Under Trump’s latest travel restrictions, for example, Americans are now barred from patronizing businesses in Cuba that are owned by or benefit the communist regime, according to The Washington Post. But Professor Feinberg argued Thursday night that the Cuban people also have benefitted from more open relations with the U.S.
Cubans have more freedoms today and more economic opportunities, he said. They can travel outside the country and can start private businesses, which now employ about 25 to 30 percent of the Cuban workforce, especially in businesses that cater to the growing tourism industry, such as restaurants, boutique hotels and beauty salons. Feinberg said the U.S. shouldn’t roll back relations with Cuba. American companies should be allowed to invest in Cuba’s emerging economy, which, as the island prospers, could bring more freedoms for the Cuban people. “Of course, make no mistake, right now Cuba remains an authoritarian, one-party security state. It’s frozen and still stagnant in many respects. But we should also recognize that changes are occurring on the island. These changes are visible to anyone who visits the island and talks to Cubans on the island,” he said. When a new Cuban president takes office in February, he must accelerate economic change or “the regime will be in serious trouble,” Feinberg said. This economic progress will offer more choices for Cubans, and may lead to more choices for them in their society, as well. “This transition from a more open economy to a more open society is not guaranteed – we know that as social scientists — but it makes it more probable. It’s creating conditions where that’s more likely to occur,” Feinberg said. For many decades, former Cuban president Fidel Castro “thrived on confrontation” with the United States and rebuffed any attempt by U.S. leaders to extend an olive branch, he said. Instead, Fidel Castro portrayed America as the enemy and used that as justification to maintain a national security apparatus and a repressed economy. “National security states search for external enemies. For too long the U.S. fell into that obvious trap,” said Feinberg, who worked in the Carter and Clinton administrations. “I can’t understand why we would even consider returning to such a failed policy. That might feel good to some frustrated Cuban Americans in South Florida, but it does not help Cubans in Cuba. It is not likely to accelerate change on the island – definitely not,” he added. Rodiles and former political prisoner de Fana, however, countered that Obama’s policies also were a failed plan to promote democracy in Cuba. President Raul Castro continues to call the United States “the enemy” and has not changed the repressive political and legal system in Cuba. The United States should not establish diplomatic ties with a totalitarian government that violates human rights, said de Fana, who was sentenced in 1962 to 20 years in prison for his fight for democracy. He was released in 1983 and now directs the Miami-based Plantados Hasta la Libertad y la Democracia en Cuba.